I have terrible news: the answer is, you can’t, you shouldn’t, it won’t work. So. Tools and best practices for changing your team’s habits, regardless of what’s happening with the top-of-the-food-chain leadership and company-wide culture… um… mmmm… as I was saying. Terrible news. You can’t. You shouldn’t. It won’t work. You know that Peter Drucker quote, “Culture eats strategy for breakfast”? Company culture, organizational culture and company-wide habits devour and destroy grassroots and team-level initiatives 99 out of 100 times. I’m sorry. I don’t want this to be true, because I want you to be able to change your little fiefdom, and, perhaps, to change the meta-culture of your company from within. But your odds of success are not good if you’re working in a vacuum—because nothing works in a vacuum. I go to Melody Wisoley, an organizational effectiveness facilitator with In Tandem HR Consulting Inc., hoping to find you a loophole. Well. Yeah. We all know this—most of us have been unfortunate enough to serve time in such an organization. But… give me hope, woman! “Most employees come into organizations and into roles genuinely wanting to do good work,” says Wisoley. “They want to be successful and to help the organization succeed.” Right. Exactly. So. All we have to do is tap into that desire and run with it. At the team level. Why does it have to come from the top, be company-wide? Because company culture is effectively a collection of meta-habits (Duhigg calls them keystone habits), and meta-habits are more powerful than individual habits. (Changing meta-habits is no task for the weak-of-heart either.) If you’ve tried to quit smoking in a smoking culture—or to maintain your “No, thank you, I don’t drink” commitment during the Calgary Stampede, Klondike Days or the festive Yuletide season—you know this power dynamic intimately. You know how much effort it requires to maintain the individual habit against the peer-pressure of meta-habits. The same rule applies at work, in business. Their collective habits are going to do battle against the new, emergent one you’re trying to establish. And they’re going to win, 99 out of 100 times. Now, if you’re willing to play those odds—there are things that you can do. The premise of Duhigg’s The Power of Habit is, really, that the brain is lazy and will cut corners and do everything and anything to minimize effort and energy, and the creation of habit and routine is the weapon in its maximize-ROI-do-as-little-as-possible arsenal. The key to changing a bad habit into a good one is deceptively simple—keep the trigger and the reward (outcome, sort of) the same, but insert a new routine after the trigger. Say, for your team, it goes like this: you get the green light on a new project. That’s the trigger—and here come the bad habits. The complaining. The in-fighting. The poor communication. Now, despite all of that, most of the time, the end result is that the project gets done, perhaps even done well. And the poorly communicating, complaining wankers you work with—er, I mean, your team members—get rewarded: they’ve met their metrics, they get to keep their jobs, maybe even get a bonus. Alas, alas… at team level, department level? If those new habits of your nascent, evolving team culture constantly rub up against the meta-habits of the organization, if your CEO thinks you’re misguided or downright wrong… it’s not going to work. “Not even if someone’s really, really determined?” I ask. So… don’t. You can’t. You shouldn’t. It won’t work. Exception: if the leadership at the top supports your attempts at changing your team’s habits—and is, perhaps, willing to learn from you? Watch what you’re doing as a pilot project, and then deploy it in other departments if it works? At the very least, to not actively combat you: if what you’re doing does rub up against other processes and structures, be willing to make exceptions, adapt to your changes… If that’s the case, okay, try. Maybe you’ll be that one out of 100 that works. Otherwise? Darling, you’re clearly amazing, a high potential, marketable and desirable. So you have a choice. 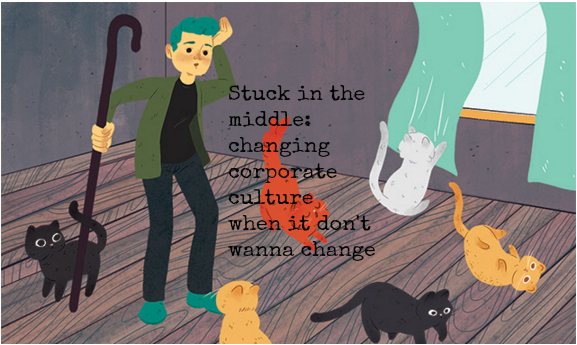 Stay in a company with a toxic culture and a leadership that makes managing in the middle impossible and become habituated to the toxic meta-culture that you’re trying to change—or take your talent somewhere where it will be supported and valued. Damn right I just told you to quit your job. Downturn, recession? Meh. It’s a cyclical thing. You’re talented. You’ll be okay. Be the change you want to see in the world in a company where you stand a chance of success.